Last night we popped down to The Roxy Bar and Screen for an enjoyable evening of short films hosted by Short & Sweet. The program featured an eclectic and inspiring mix of films, including music promos, animation and BAFTA winning drama. One of our favourites from the evening was Oh Willy, an humorous and beautifully crafted stop frame animation by Emma de Swaef and Marc James Roels. We also managed to catch the first screening of an ident we created especially for Short & Sweet, with a lovely little introduction from the host of the evening Jack Robinson. You can check out the ident for yourself below. We have a few more idents in the pipeline for Short & Sweet so watch this space to see what we come up with! Short & Sweet London will be running at The Roxy Bar & Screen every Monday until the 26th March, with upcoming events planned for New York, Toronto and Capetown. We are always interested in new collaborations so if you think you might like to work with us – you can see an overview of what we do for TV and film here, get in touch by phone 0208 891 4537 or email info@pleasefindattached.com if you would like to discuss a new project. After a pretty busy couple of months (in between all the bank holidays) I’ve finally found the time to share some thoughts on the exhibitions, artists talks & performances from Pictoplasma 2011. The following are some of my highlights, but the line up of artists was huge so I urge you to head over to the Pictoplasma website and check out some of the other artists involved! 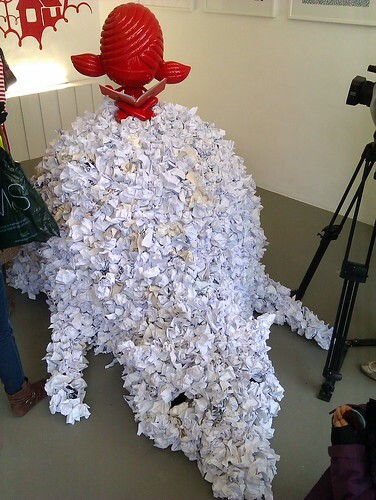 First off, is one of my favourite creatures from this years Pictoplasma, PAPP. 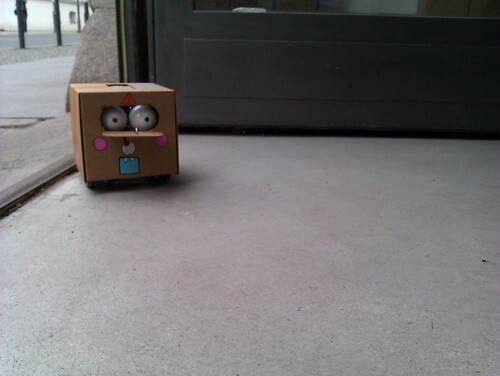 PAPP is a nervous little robot creature who lives in a small cardboard box, developed by Hilde and Bard of 3753% Tordal. PAPP runs an opensource program written by Bard, which uses motion sensors to detect potential predators. If PAPP senses a threat, it will turn in the opposite direction and run, but if the threat proves too great, PAPP will shut down all signs of life and become an inanimate cardboard box. PAPP is both and interactive companion and artist platform/canvas as the Tordal duo run workshops to create new skins for PAPP and for Pictoplasma 2011 they invited a number other artists to doodle on the PAPP box. I managed to get involved during one of the PAPP workshops, creating my own PAPP design and having a lovely chat about art and technology with the Tordal team! After a long day on the character walk on the opening day of the festival, I ended up at The Dudes Factory for the launch of their new collection in collaboration with French designer and illustrator McBess. At The Dudes factory I was able to catch some live illustration by McBess himself and found it most interesting to see the process and completion of such a large piece of illustration. It was great to get up close and personal with the finished piece and inspect some of the detail. After taking in the live illustration and new tshirt collection, me and the rest of the partygoers were treated to a few numbers performed from the back of a truck by the aforementioned steak loving artist and his band of dead pirates. After spying a small snippet in the Pictoplasma festival guide, I knew I would love the work of Amandine Urruty. Seeing her original artwork in the character walk and hearing her artist lecture confirmed what I already knew! Amandine’s illustrated pieces are a healthy mix of grotesquely surreal and painfully cute, filled with unnatural and troubling bodies (think John Carpenter’s ‘The Thing’ bursting out of a Care Bear) all beautifully rendered in coloured pencil. Featuring both in the character walk and the artists talks, I had a chance to experience Amandine describe her extraordinary creative process in her own eccentric way. My highlight was hearing tales of 12 hour horror film filled illustration sessions and finding out the Amandine’s seemingly arbitrary yet amusingly accurate secret formula for the perfect Amandine Urruty piece. Emphasising the importance of determination and self belief, I found Rilla Alexander’s talk truly inspirational and motivating. It was clear that the sentiment of her talk forms the underlying theme of Rilla’s new book ‘Her Idea‘ which tells the story of Sozi, a creative character on a journey to bring her ideas to life! 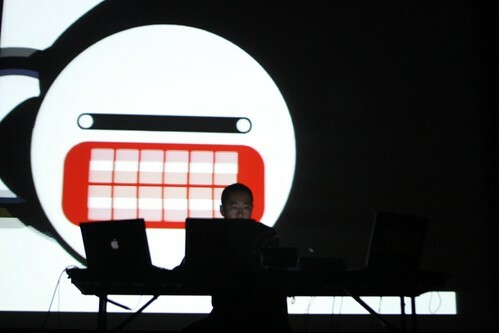 On the last night of the Festival, I was blown away Motomichi Nakamura’s performance at the closing party. With a strobing mix of red, white and black (as is always the Motomichi way) and a dose of ultra fast techno with extra bass, Motomichi put on a truly terrifying show. 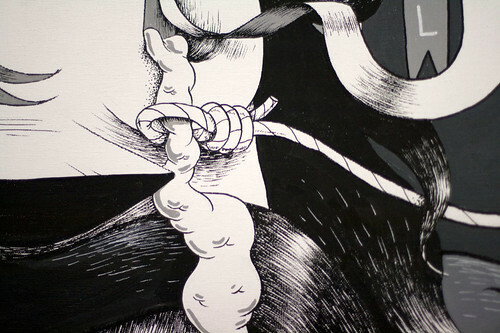 Motomichi’s own brand of fear ended the festival for me, on a supercharged high! So thats its for my Pictplasma 2011 highlights, its only a small snippet out of the huge number of inspiring artists and events so dont forget to check them all out over at Pictoplasma.com. 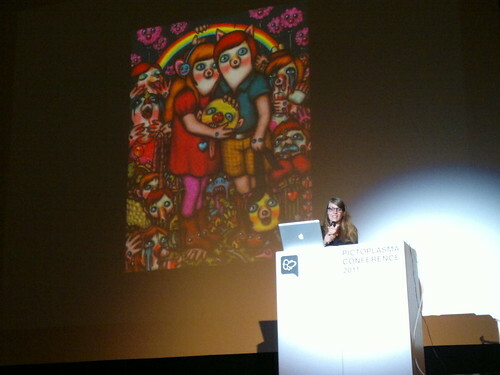 After experiencing Pictoplasma for the first thing this year, I’m sure it will become a regular fixture in my calendar! Pictoplasma Festival 2011 Opener from Pictoplasma on Vimeo. Tomorrow I will be leaving the office and jetting off to Germay’s hippest city (Berlin) to experience the wonders of contemporary character design at the 2011 Pictoplasma festival. Spread over 4 days Pictoplasma 2011 features a huge schedule of events including: talks from the likes of McBess, Nick Cave, PicPicAndre, Rilla Alexander & more, a colossal character walk occupying 25 galleries & spaces and featuring sculpture, illustration, performances and installations. A number of screenings showcasing moving image and animation from some of the best and not forgetting a few parties thrown in to keep the festival goers feeling merry! Over the the course of the festival I’ll be sharing my musings via twitter and upon my return I shall be following up with a full write up documenting my experiences. In the meantime, here are a few bits that I’m particularly looking forward to. Inkygoodness have build a set of wooden totem sculptures and asked a bunch of talented artists and illustrators to customise them. On their journey to bring the Character Totem to Berlin, Inkygoodness hosted live drawing events across the country. The fruits of these events will be exhibited with a selection of submissions from the ‘colour me totem’ open submission. This years festival finale presents a gallery of research findings from an ongoing quest to find a creature thought to be our evolutionary missing link, otherwise known as Big Foot (among other names). 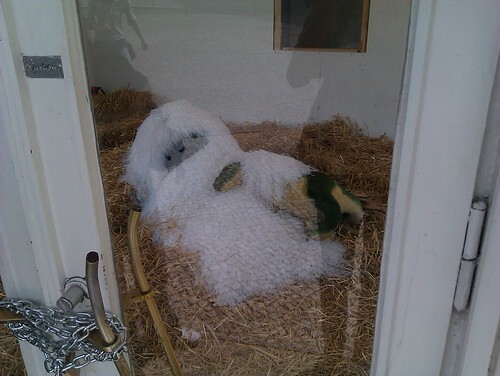 Alongside the wealth of yeti images will be performances from Dan Deacon, Maximillian Hecker, Jared Gradinger & Friends and Motomichi Nakamura. Jeremy Dower is a creator of beautiful digital paintings. His work often depicts characters floating in a dream like non-space, with a level of detail that give his pieces a feeling of tangibility. Dower’s exhibition at pictoplasma 2011 takes a journey through the common themes of character art (anthropomorphism, cuteness, the grotesque etc.) through the medium of a shape shifting dog.